Down in the heart of Michigan City lays an art center, but not just any old art center. I&apos;m talking about Lubeznik Center for the Arts, and it just so happens that I decided stop in and experience their Citizen*Soldier*Citizen exhibit this past Sunday. The exhibit is a collection of pieces created from veterans of our armed forces that explores modern warfare and reintegration of U.S. soldiers into society using art as a coping mechanism. The images contained within the exhibit are graphic, as is the nature of war, so it may not be suitable for all children. Nonetheless, we learn of the horrors of war from those who witness it, and this visual expression is an opportunity for us citizens to witness the echoes of their experiences. 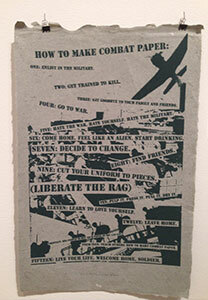 An interesting concept displayed at the art center was from the Combat Paper Project. The project takes the fibers of military uniforms used in combat and turns them into paper. This paper then becomes the canvas for their messages. Several artists used the technique with a result looking something similar to a leather hide. One artist, Chris Arendt, even went as far as to teach us how to make the paper step-by-step. Experience is the only word that can somewhat describe the power of the exhibit. The haunting glare of a village youth behind her veil, a trio of disembodied Iraqi busts, and the mournful salute of a grieving Marine are just some of the pieces that leave the brain scrambling for words. Words never come, though. At least words aren&apos;t formed by the viewer initially. They&apos;re an after effect upon reflection. The artists, however, have other things to say and they use their artwork as the medium. What is great about the Combat Paper Project was the combination of both words and images. "Rags make paper, Paper makes money, Money makes banks, Banks make loans, Loans make beggars, Beggars makes rags," reads the copy of a piece describing the artist&apos;s idea of a never ending cycle. It reads like the artist&apos;s capitalistic impression of the water cycle in his own words. There are sculptures, cups, ceramic impressions of the terrain, and bloody penguins still filling the room...but one piece keeps grabbing my attention. As I continue my way through the room, I notice this woman glaring at me. She wears a veil and all I can see are her eyes, but it&apos;s all I need to see. Her eyes are condemning. Shadows form in the side pockets of her eyes and her mouth is covered by a keffiyeh. To me, she is a citizen of war and a reminder from a soldier to remember the innocents. Needless to say, her gaze is worthy of remembrance. The large and hung piece was also made from combat paper. Traditional art forms are also found within the exhibit at Lubezniks including a ceramic cup collection with richly incised carvings. The cups present a wide range of techniques that involve words and imagery on a miniature scale. Regardless of how small the piece is though, each piece can still leave a memory the size of a crater. 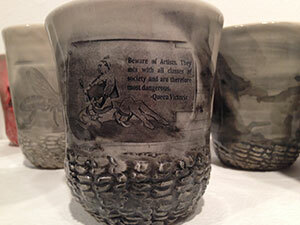 There is a symbolic quote from Queen Victoria on one of the cups that reads, "Beware of the artists. They mix with all classes of society and are therefore more dangerous." The artists represented have definitely done their own share of mingling within society it seems. 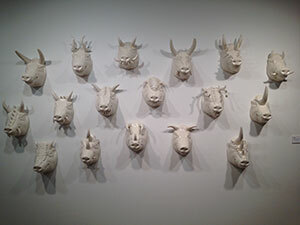 Perhaps the most politically charged collection of the whole exhibit is the first set of hung ceramic pig heads. The artist, Giuseppe Pellicano, describes the heads as "trophies," further stating that the horns and teeth represent viciousness, while the white glaze covering each head represents the masking of political agendas by those who hold power. The pigs represent deception and the withholding of motives. Every head holds horns and many have gnarled teeth. People may say that art is an acquired taste. So is being a vegetarian, and everyone knows vegetables help us live just a little bit longer. Art, like vegetables, is good for the heart! Why not try it? After experiencing Citizen *Soldier* Citizen, I think I can say it gave me a hunger. Why shouldn&apos;t it? Right in our own backyards is a public art center displaying world class pieces and all they ask for entry is a donation. For the fellas out there, what better way is there to show your sophistication than maybe taking your girl out to the center? The donation fee even makes it a bit more philanthropic, so to speak. Of course I can&apos;t forget our lovely mothers out their either, so I have good news. If you can&apos;t catch Citizen *Soldier* Citizen, Lubezniks&apos; has the Coastline Children&apos;s Film Festival coming up February 8! Maybe you want to stop in a bit sooner? On Saturday, January 25th, LCA is holding Family Art Day from 12-2:00pm. Take my word on this one, folks; Lubezniks Center for the Arts is a gem in our backyards. We all know that the only way to hold a gem is to go digging. If this blog is anything, let it be the shovel that helps you uncover this gem. Go! Dig! Experience the mind-blowing exhibits at LCA! ...A lot of you may be saying to yourselves right now, "C&apos;mon Tyler! You can buy gems. No shovels necessary." That&apos;s right. I guess you can own gems by buying them too. I carry more good news then. A number of pieces on exhibit are up for sale! (They would look great on that open wall, in case you were wondering.) Of course it&apos;s totally okay if Citizen *Soldier* Citizen isn&apos;t for you. 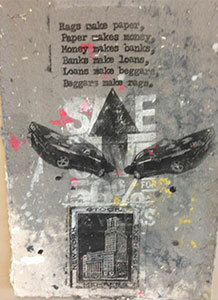 Head on over to Lubeznikcenter.org and check out some of their upcoming exhibits. People, people, people! I can hear those stomachs gurgling. Go on and grab yourselves a taste for the arts.